The Ries impact crater is one of the best investigated terrestrial impact structures which is not so much related with its impact character in itself. Already in the 19th century the Ries crater (or Nördlinger Ries) was considered a geologic anomaly, and well until the 20th century many scientific controversies about its origin were fought out based on an extensive and thorough geologic mapping and early geophysical measurements. Apart from a few tectonic and glacial hypotheses, various volcanic processes were debated, and finally a central giant volcanic diatreme explosion became solid textbook knowledge. Until the early sixties. At that time the US geologists E.M. Shoemaker and E.C.T. Chao established the shock-produced SiO2 high-pressure polymorphs coesite and stishovite in the classic “volcanic” suevite rocks. The opposition of most geologists was vehement but in the end was unable to prevent that the Ries crater began its “impact life”. Today, the impact nature of the Ries crater has generally been accepted, although some cordial dislike of meteorite impact is still to be observed among geologists. the author Richard A. Zimmerman, rehashing the old story, postulated a diatremic formation of the Ries crater. 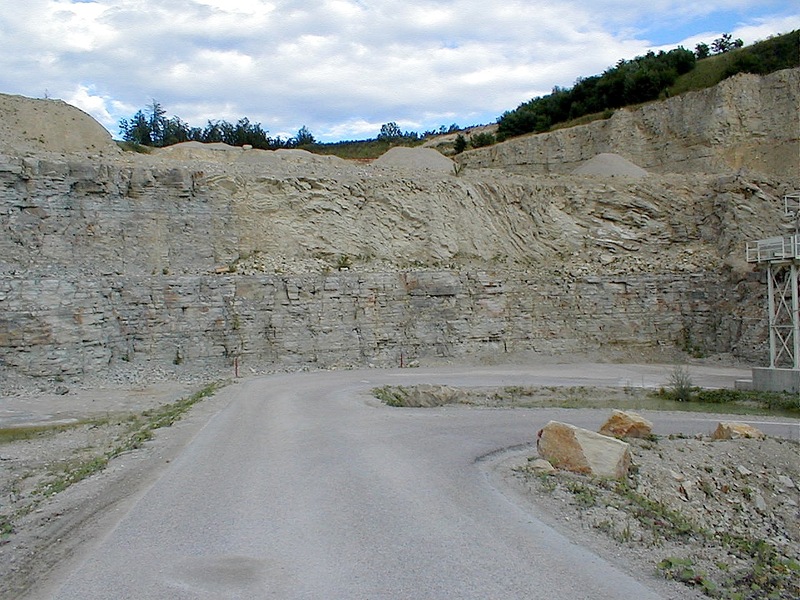 In the Otting Bunte breccia-suevite quarry (equivalent to the Aumühle outcrop, see below) he observed a time lapse with some reworking between the two units (see Fig. 5) and concluded a repetitive action compatible with volcanism but incompatible with impact. 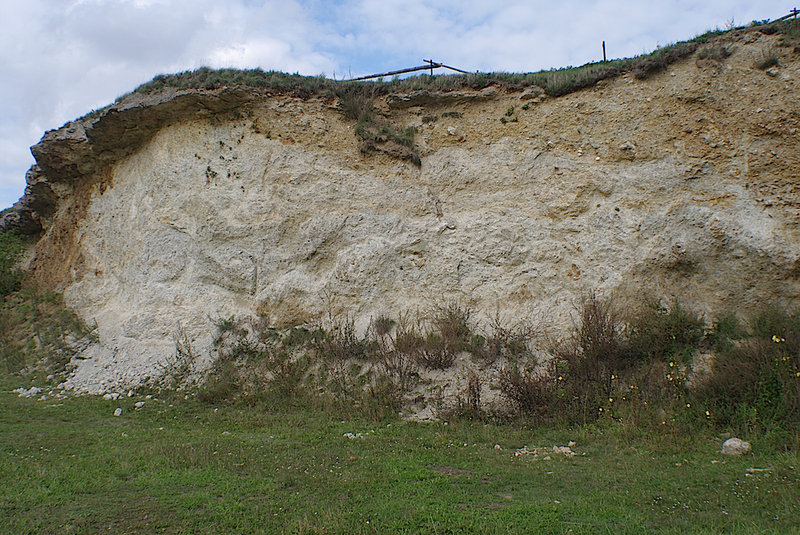 More about this classic geological debate on impact structures and their combating may be read HERE. From the many quarries in the Ries crater region that in the early period of geologic investigation gave abundant insight into the cratering and depositional processes only few are still active exposing new views at times. 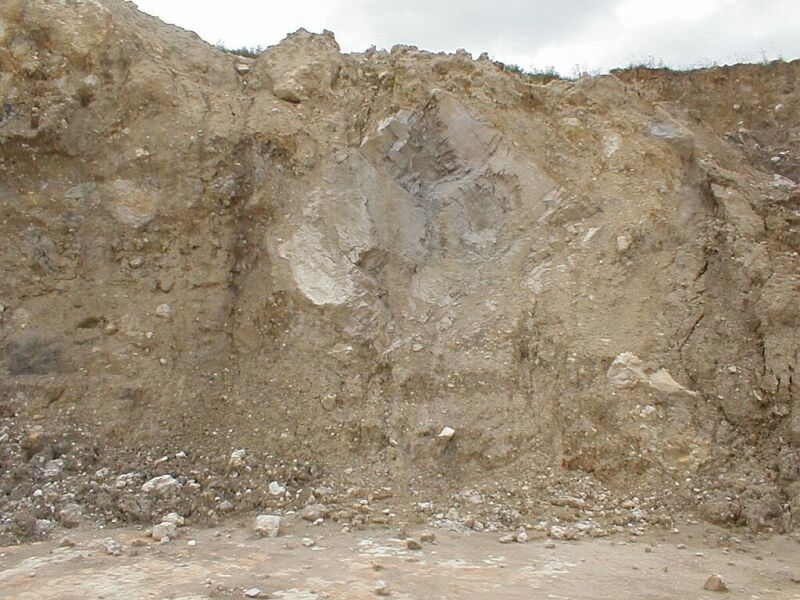 These are, e.g., the limestone quarries located at Gundelsheim, Ronheim and Harburg where the Bunte breccia ejecta overburden has continuously to be removed. From the at one time numerous suevite quarries only a single one (Aumühle, see below) is exploited at times. 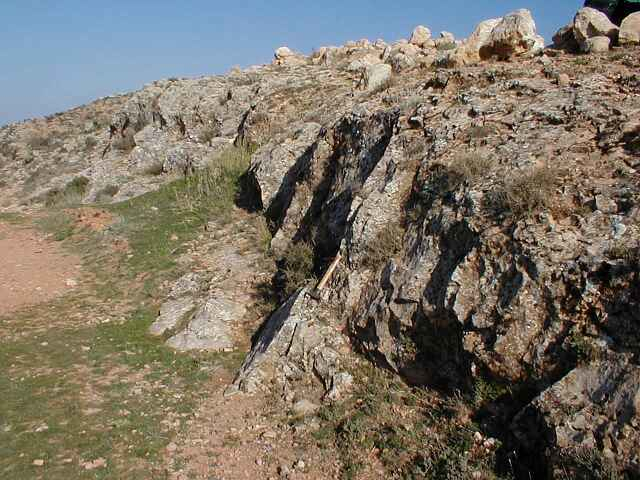 To prevent the complete disappearance of classic Ries outcrops and quarries the authorities have established a geologic educational trail, and also a geopark addresses the geologically interested parties. Fig. 1. Bunte (= multicolored) breccia ejecta on top of Malmian limestones. Gundelsheim quarry, roughly 21 km from the crater center. The emplacement of the ejecta caused prominent striation marks uncovered in the foreground. Fig. 2. Bunte (= multicolored) breccia ejecta on top of Malmian limestones. Gundelsheim quarry; different view. Fig. 3. Malmian limestones; prominent striation marks from erosive landing of the Bunte breccia impact ejecta. Gundelsheim quarry. Similar sets of striations have been observed at various places in the surroundings of the Ries crater, and from measurements of the strike directions an intersection in the center of the Ries basin was obtained. 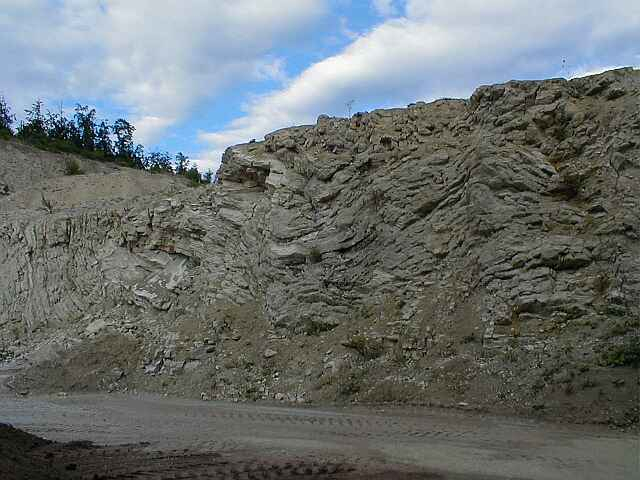 Aumühle is the only suevite exposure in the Ries impact structure which is currently exploited for the cement industry supplying aggregate for underwater purposes. Fig. 4. 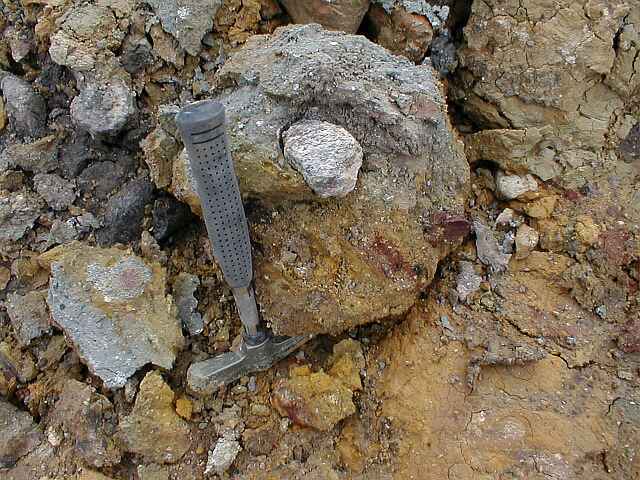 Suevite (grayish) in contact with and overlying Bunte breccia ejecta. 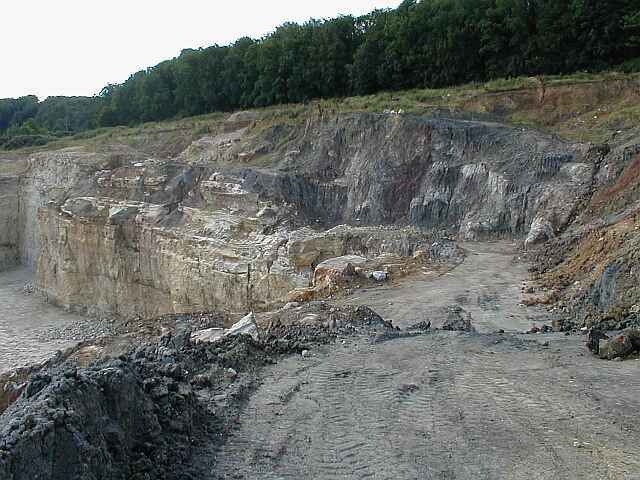 Aumühle quarry; roughly 12 km from the crater center. Fig. 5. Detail: suevite over Bunte Breccia ejecta; Aumühle outcrop. Apart from a thin transition zone (whitish) the sharp contact between the Bunte breccia ejecta and the overlying suevite ejecta without any mixing proves a lacking erosive component of emplacement of the suevite and points to steep excavation and landing trajectories and a fallout deposition of the suevite. – The widely spaced horizontal and vertical joints may be cooling fractures that developed after emplacement and solidification of the hot suevite body. 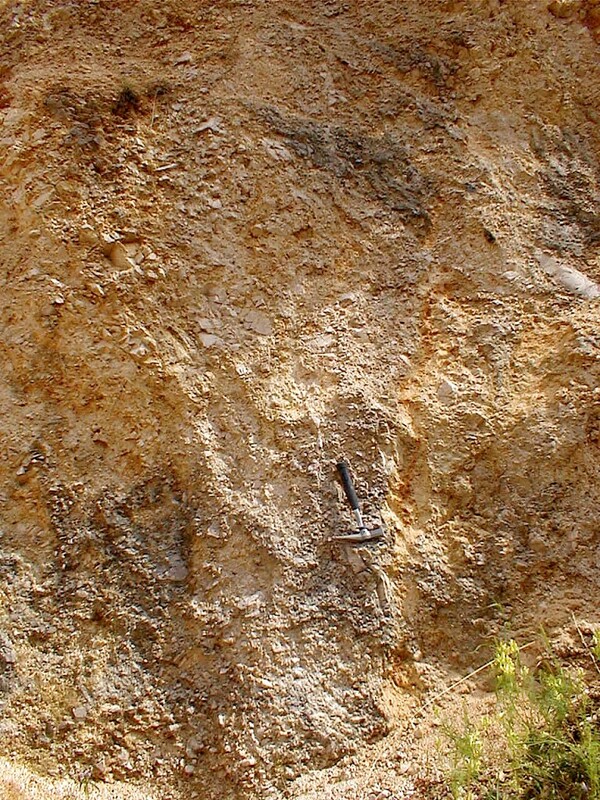 A platy vertical jointing within a suevite deposit that is assumed to also result from cooling is exposed near Cucalón in the Azuara impact structure, Spain. A photo may be clicked HERE. Fig. 6. 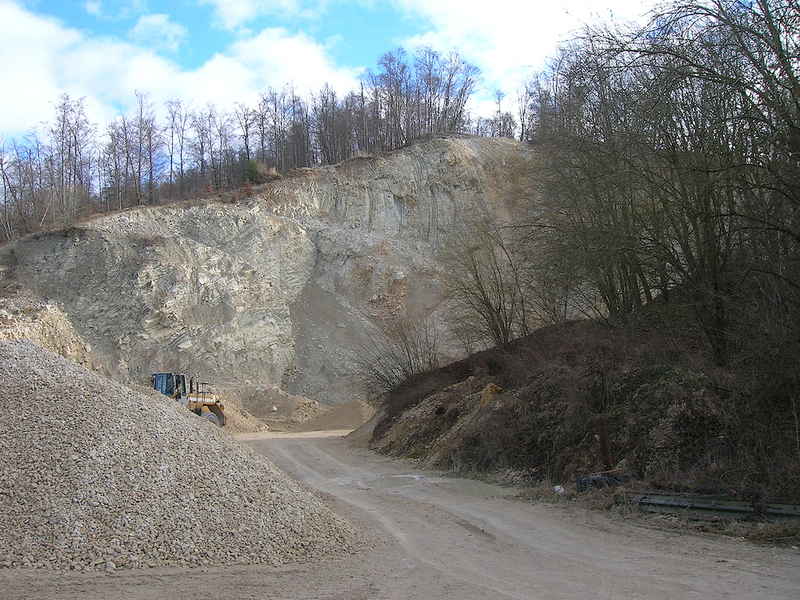 One more detail: Aumühle quarry – suevite in contact with Bunte breccia ejecta composed of sedimentary rocks from Keuper and Liassic/Dogger. Fig. 7. 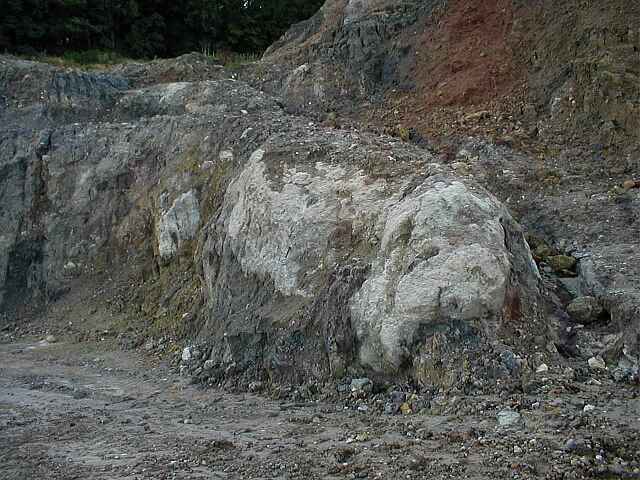 Massive suevite body in the Aumühle quarry. The blocky jointing is particularly evident. – Columnar segregation of the suevite similar to basaltic columns can be observed in one of the abandoned suevite quarries near Oberringingen. Fig. 8. The arrows point to proposed degassing pipes (or channels) that could have developed when the suevite cooled after emplacement of the hot mass. The Limberg quarry is located in the megabreccia zone between the structural crater rim and the inner or so-called crystalline ring wall. 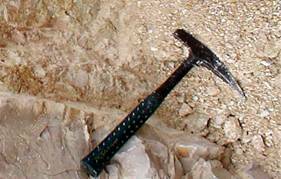 The mixed crystalline – sedimentary target enables a much better reconstruction of the imapct cratering process than do purely crystalline targets. The crystalline rocks of the inner ring were uplifted by at least 600 m which is the thickness of the sedimentary sequence. Fig. 9. 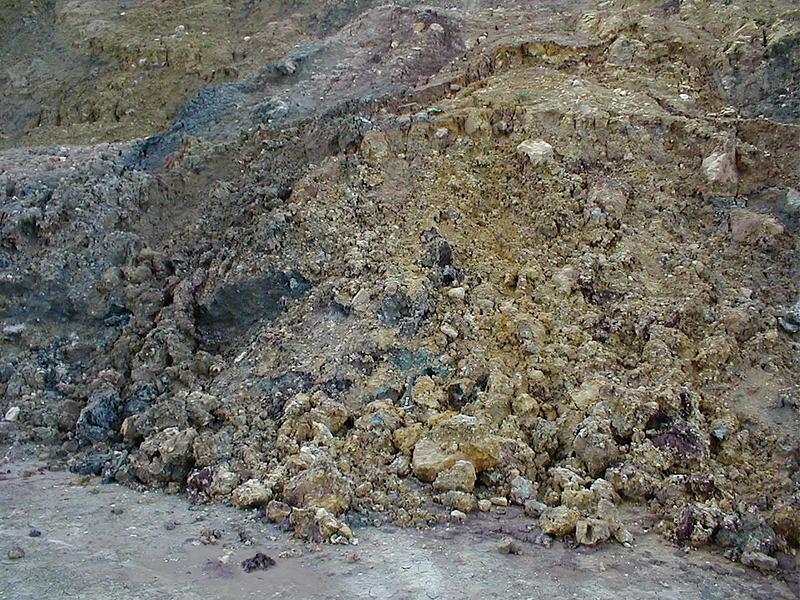 The megabreccia zone between structural rim and inner ring (Limberg quarry, near Unterwilflingen): multicolored Keuper sediments (to the left), strongly corroded suevite (?, or glass-carrying polymictic dike breccia), and grit-brecciated granitic rocks. Fig. 10. Limberg quarry in winter showing much better the variegation of the ejecta mixture. Fig. 11. Detail of the corroded suevite or, alternatively, of the polymictic glass-carrying dike breccia injected into the uplifted crystalline rocks. 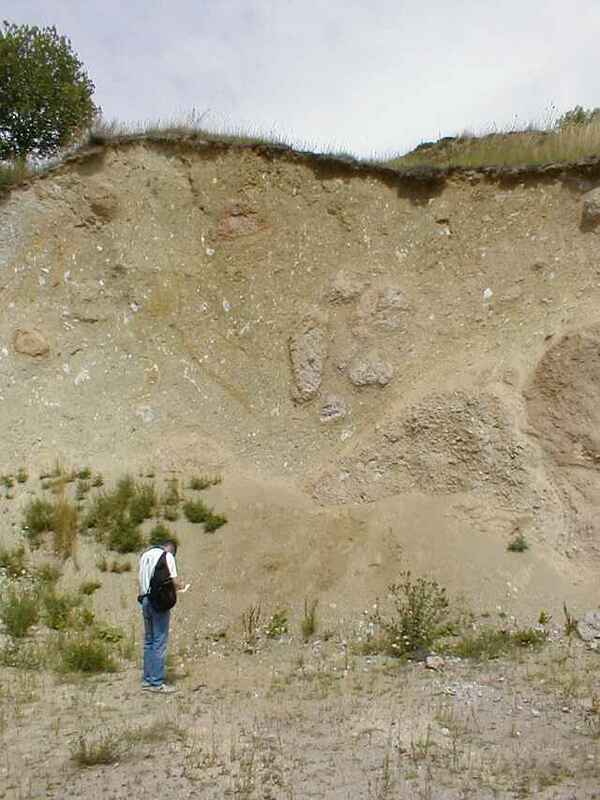 The Wengenhausen abandoned quarry as part of the geologic educational trail belongs to the inner or crystalline ring wall and can tell a story about the Ries impact as indicated below in Fig. 12. Fig. 12. 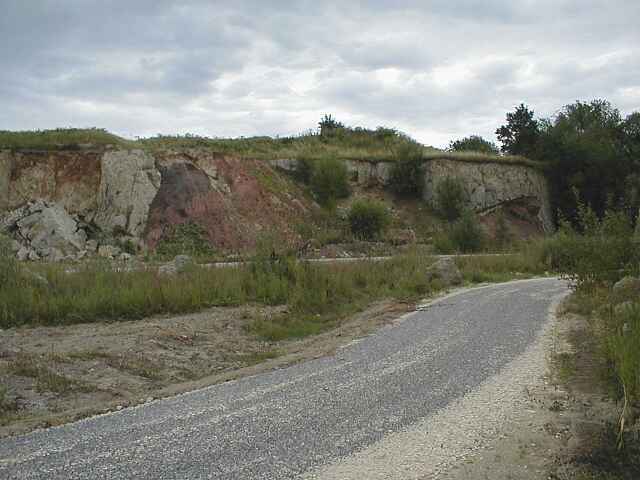 Wengenhausen abandoned quarry (now a geotope), inner ring of the Ries crater. a = heavily shattered crystalline rock (granitoid); b = paltry remnants of a hornblende kersantite dike where in the past nice shatter cones could be taken out; c = polymictic crystalline breccia; d = fossil-rich limestone that formed in the post-impact Ries crater lake. Fig. 13. Detail of the layering in the Wengenhausen outcrop: light granitic rock is overlain by a polymictic crystalline breccia (brownish) and post-impact carbonate lake sediments. Fig. 15. Bunte breccia ejecta on top of Malmian limestones. Ronheim quarry, near the southeastern crater rim. Fig.16. Different view of the Ronheim Bunte breccia ejecta outcrop. 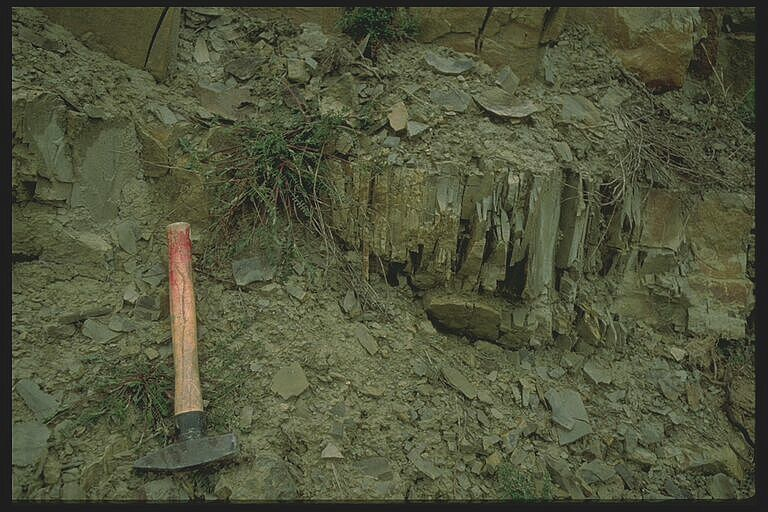 The Ronheim images must be considered a snapshot in time because in the course of the limestone exploitation the breccia overburden is continuously being removed. Fig. 17. The Bunte breccia in detail; Ronheim quarry. 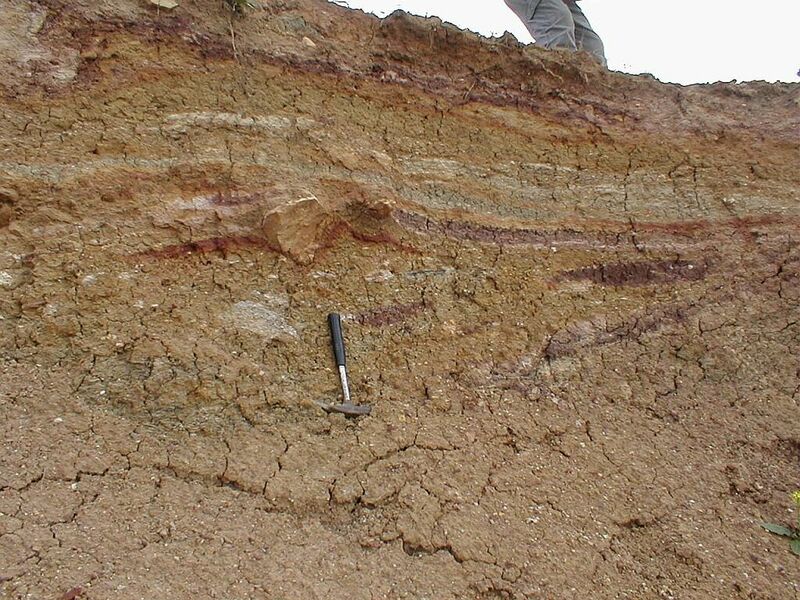 The multicolored mixture of various sedimentary and crystalline components frequently in immediate contact are evidence of the very complex excavation trajectories that brought together rocks of stratigraphically far-off positions in the impact target. Fig. 18. More evidence of the typical Bunte breccia ejecta composition. Fig. 19. 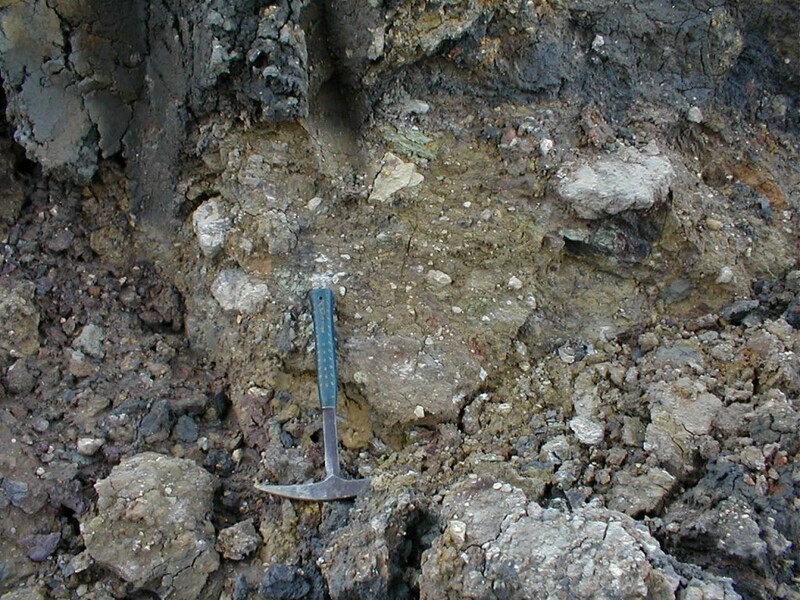 The mixture within the Bunte breccia ejecta comprises all size classes down to gravel and sand fraction. Fig. 20. 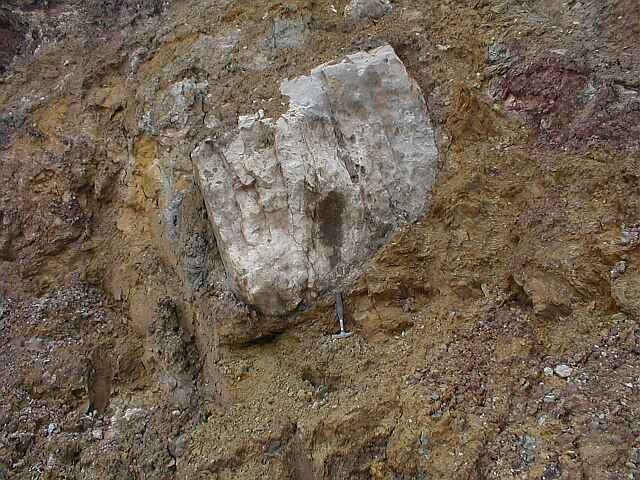 A bigger block of Malmian limestone with preserved bedding within Keuper and Liassic/Dogger sandstones and claystones. Fig. 21. Close-up: typical small-scale brecciation and mixture, here a rounded gneiss fragment in multicolored clayey material. Fig. 22. 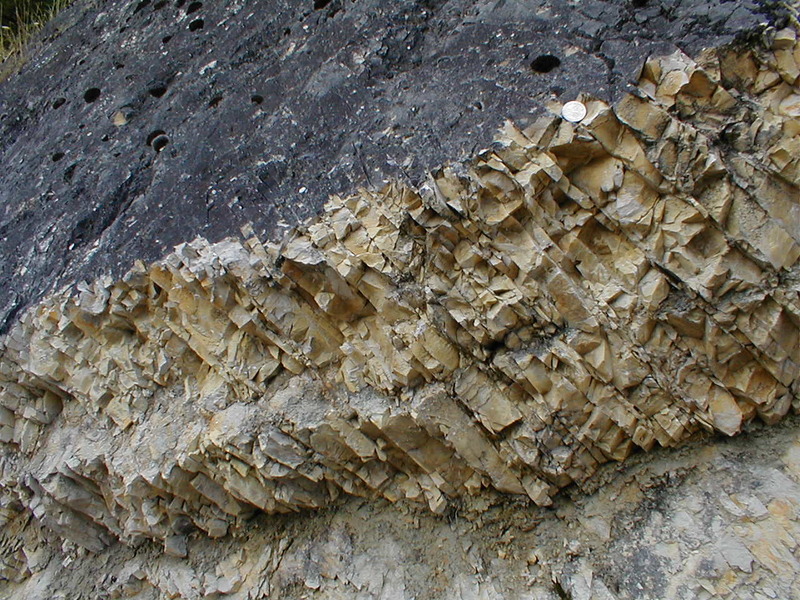 Detail showing fluidal texture of the Bunte breccia (temporarily exposed). Fig. 23. Dislocated megablock of Malmian limestone showing grit brecciation and mortar texture (monomictic movement breccia). 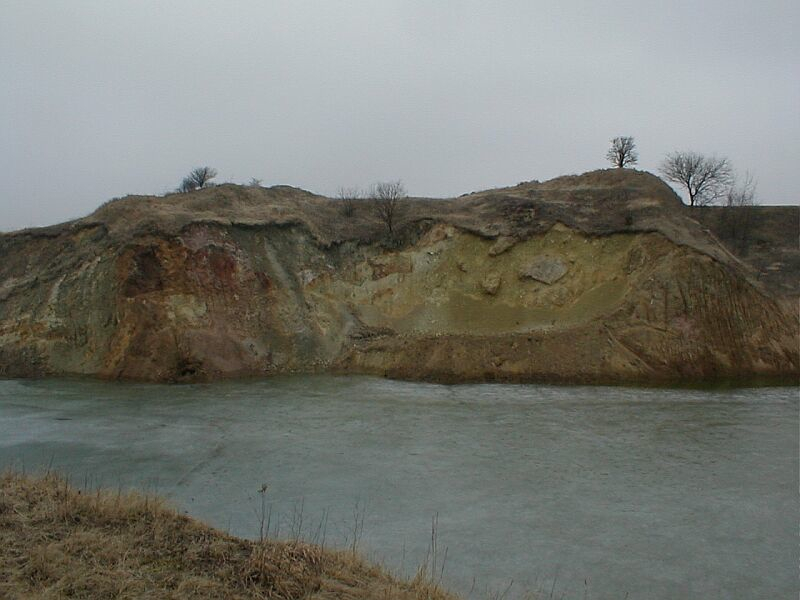 Iggenhausen quarry; 22 km from the crater center. Fig. 24. 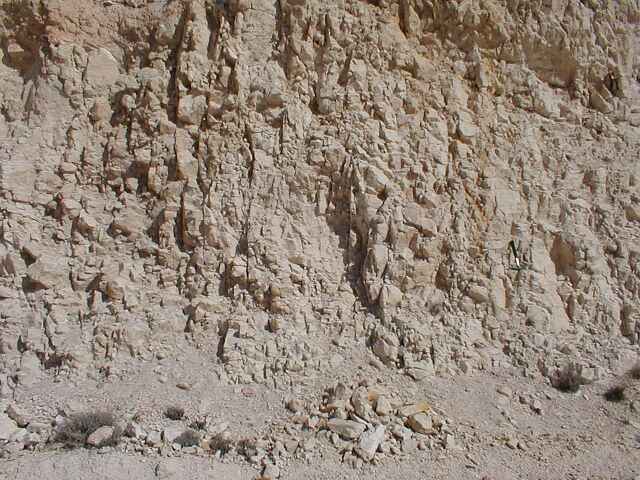 Closer view of the enormous interior fragmentation of the Malmian limestones. Fig. 25. 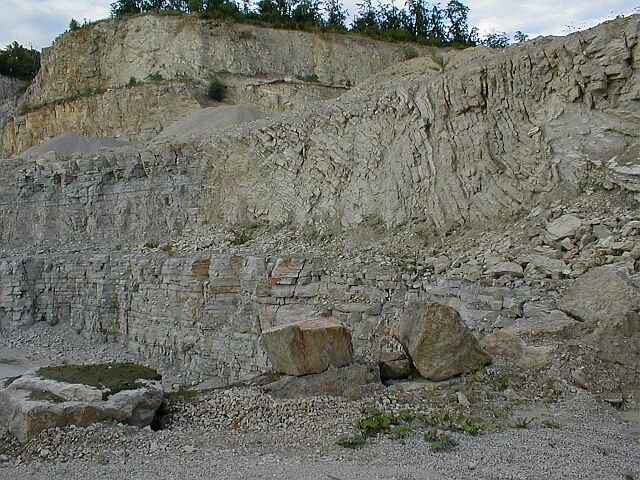 Columnar/platy fragmentation of the Malmian limestones in the Iggenhausen quarry. 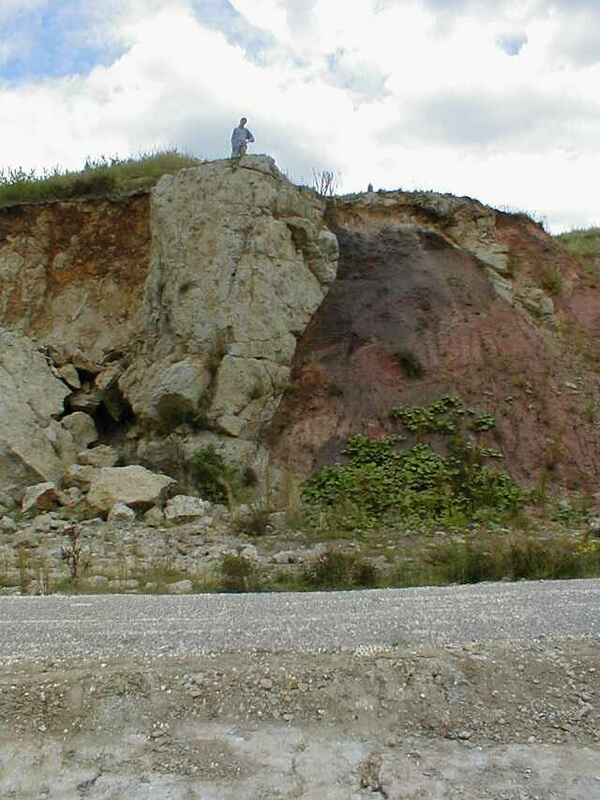 A similar fragmentation from the Azuara impact structure in Spain is shown below in Fig. 26. Fig. 26. For comparison: Very similar columnar/platy jointing in Jurassic limestones in the outer rim zone of the Azuara impact structure, north of Belchite. 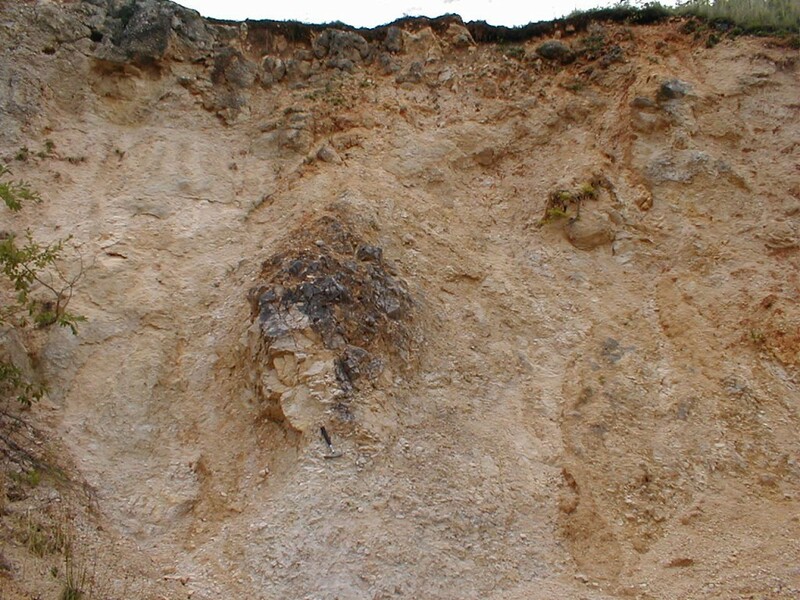 This voluminous (over hundreds of meters) kind of rock fragmentation has nothing to do with any tectonics but must be considered a characteristic impact feature possibly originating from the interaction of compressive shock and tensile rarefaction waves. Fig. 27. Closer view of the grit brecciation in the Iggenhausen dislocated megablock. Fig. 28. 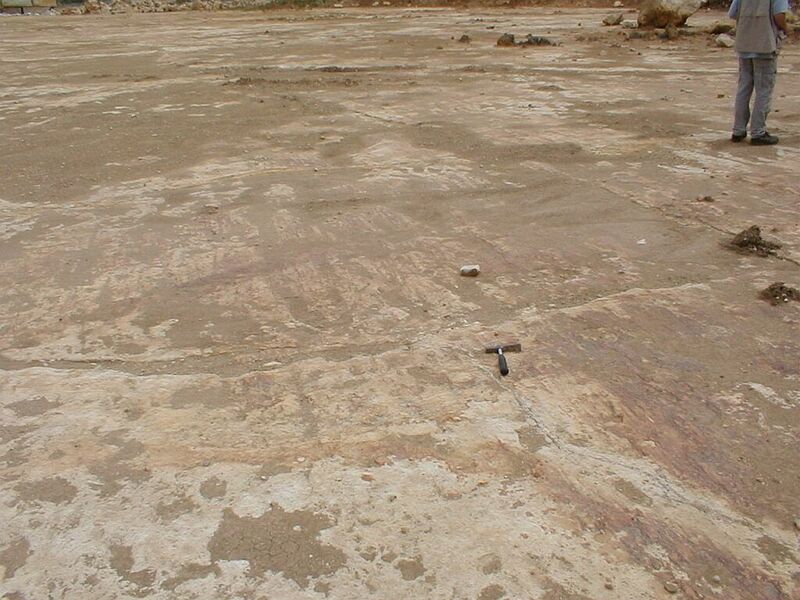 Iggenhausen quarry and a grit-brecciated block in the megabreccia zone of Barrachina, Rubielos de la Cérida impact basin, Spain: quite similar monomictic movement breccias. The abandoned quarry is located at the eastern crater rim and exposes a dislocated and overturned limestone megablock. Fig. 29. 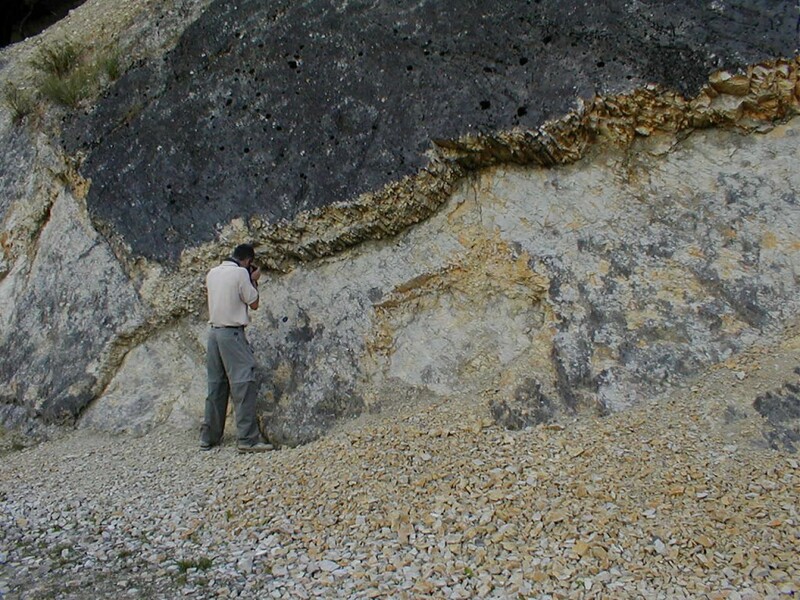 A bed of closely spaced platy jointing of the Malmian limestone is exposed – obviously an impact-related deformation. Fig. 30. 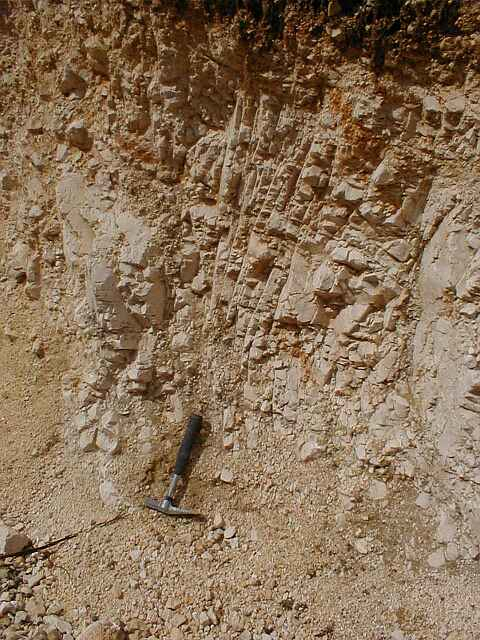 Gosheim quarry at the eastern crater rim: overturned Malmian limestone block with impact-produced platy jointing that is overprinting the normal pre-impact regional joint system. Fig. 31. 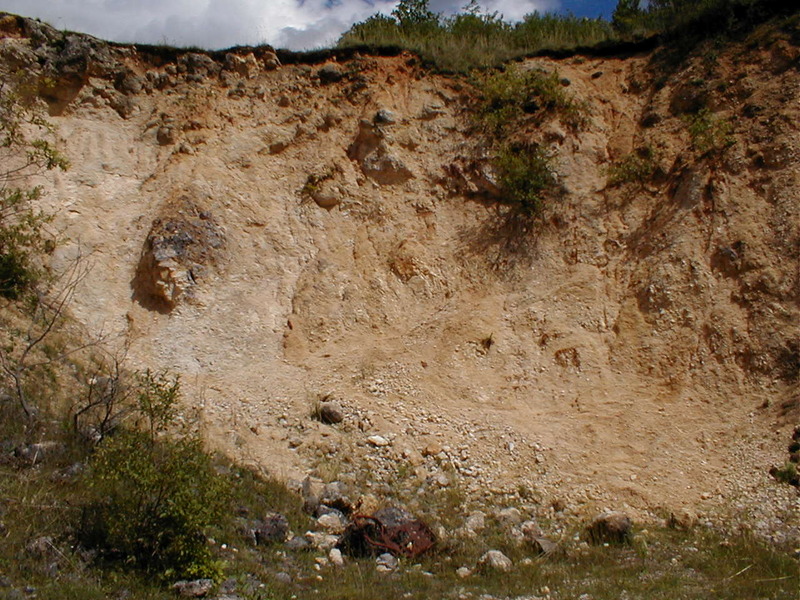 Comparable impact-induced platy jointing in marlstones north of Aguilón, Azuara impact structure, Spain. This large limestone quarry is located immediately at the eastern crater rim from time to time, depending on the exploiting progress, exposing a spectacular geologic setting. The photographs from below have been taken in 2001. Fig. 32. 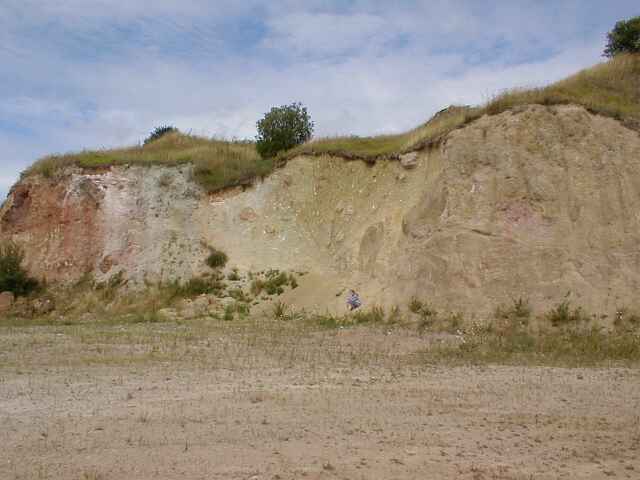 At the eastern crater rim (large limestone quarry in Wemding; formerly: Schneider). The abrupt horizontal and vertical change from well-bedded largely untouched limestone layers to strongly folded and heavily fractured rocks is remarkable and incompatible with any normal tectonic concept. Fig. 33. 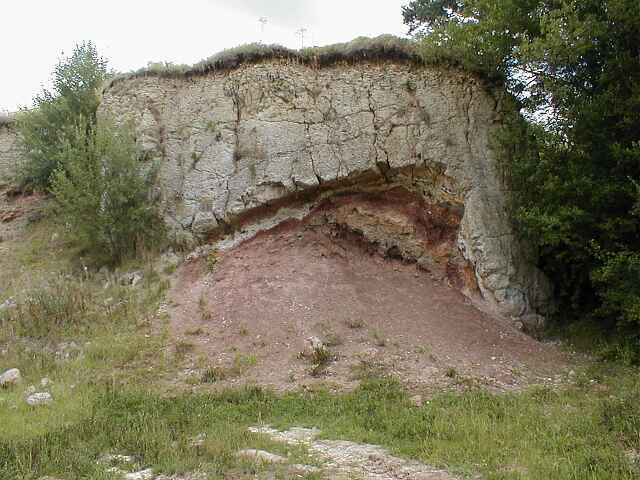 Different view of the peculiar geologic setting in the Wemding limestone quarry. Fig. 34. Another view of the abrupt transition: impact geology. 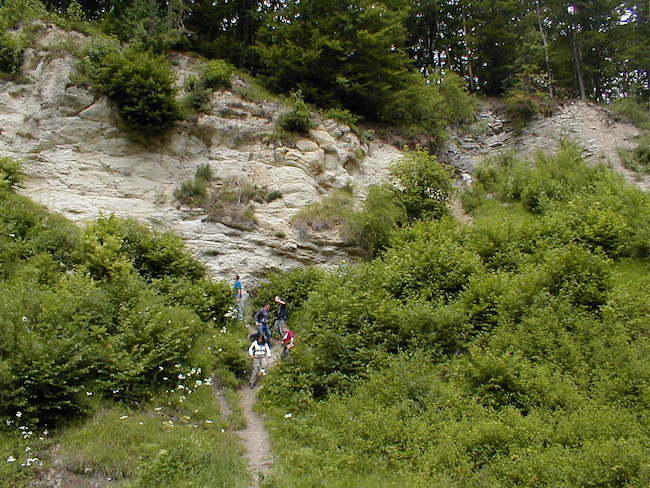 The Altebürg disused suevite quarry is located just outside the southwestern crater rim, and geologically and historically it is interesting because one of the many disputes between impact and volcanic-explosion advocates were fought out here in the sixties. Fig. 35. 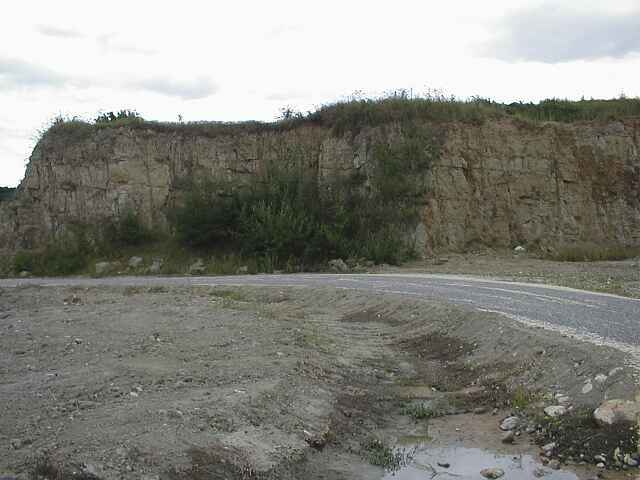 The disused suevite quarry. 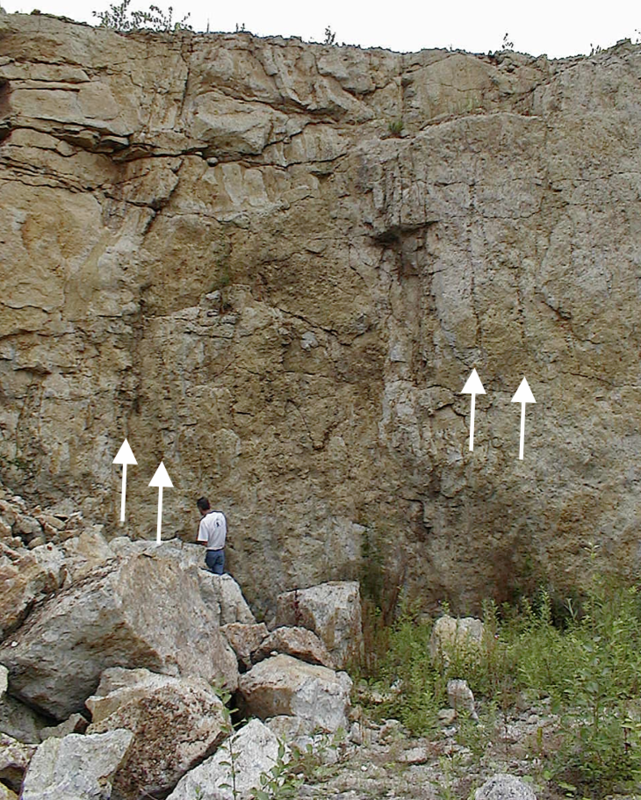 Upper right the vertical contact between the suevite and the bedded, probably allochthonous Malmian limestone is exposed. To the left outside the image the suevite is edged by Malmian limestones, too. 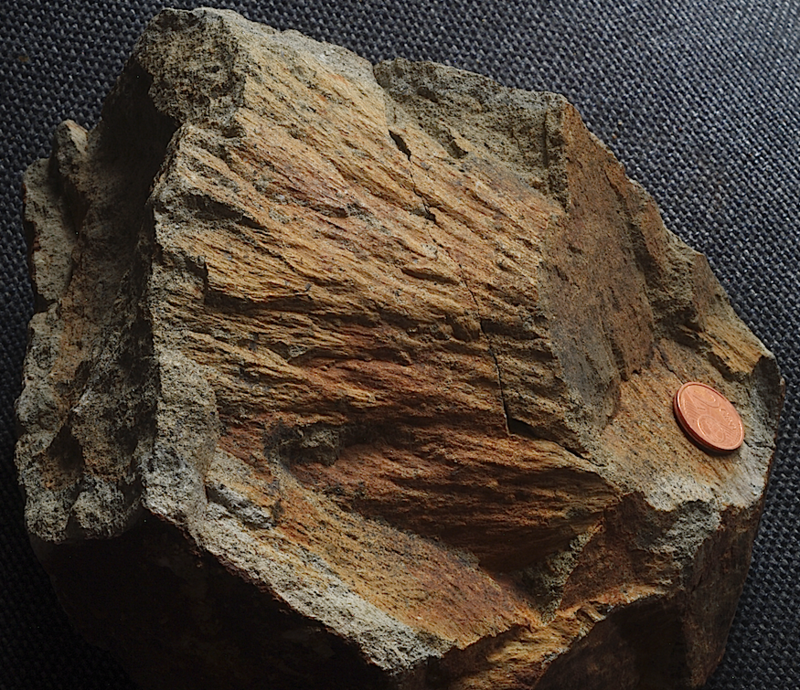 At times when the Ries crater was undoubtedly considered a volcanic explosion structure and the suevite the very characteristic Ries volcanic rock, the Altebürg setting was interpreted as a typical volcanic vent. Even when the shock-produced coesite and stishovite high-pressure modifications had been established by Chao and Shoemaker and the Ries had evolved into a big meteorite crater, skeptical geologists had still to be convinced. 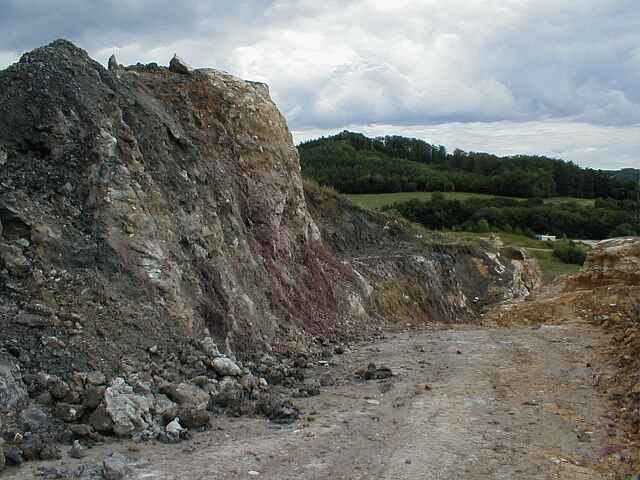 Therefore a program of about 20 boreholes were drilled in the area of the Altebürg quarry all of whom drilled multicolored smashed impact rocks in minor depth below the suevite proving that the suevite came from above and not from below. 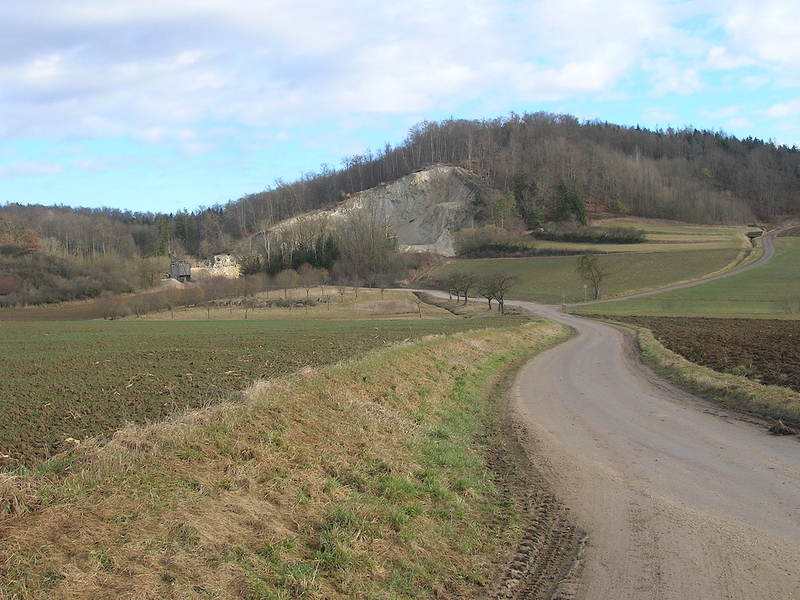 – The quarry is also well known because here the building stones for the St. Georg church in Nördlingen were exploited. The very large dislocated megablocks in the environs of the Ries crater were one of the greatest enigmas geologists were originally confronted with at times when the Ries was generally considered a volcanic explosion structure. How could a volcanic explosion be able to throw kilometer-sized coherent blocks over distances of more than 10 km? The answer came in the sixties with the identification of the Ries as a large impact structure implying a giant energy release. Fig. 36. The Oppertshofen limestone quarry in the 1 km seized overturned megablock. At Oppertshofen, some 7 km distant from the Ries crater rim, a big 1 km sized Malmian limestone megablock has been mapped to lie there completely overturned. We point to the fact that this coherent 1 km Oppertshofen megablock with fully preserved bedding and karst structures must have been overturned and moved over a distance of at least 7 km in the process of the impact event. Fig. 37. 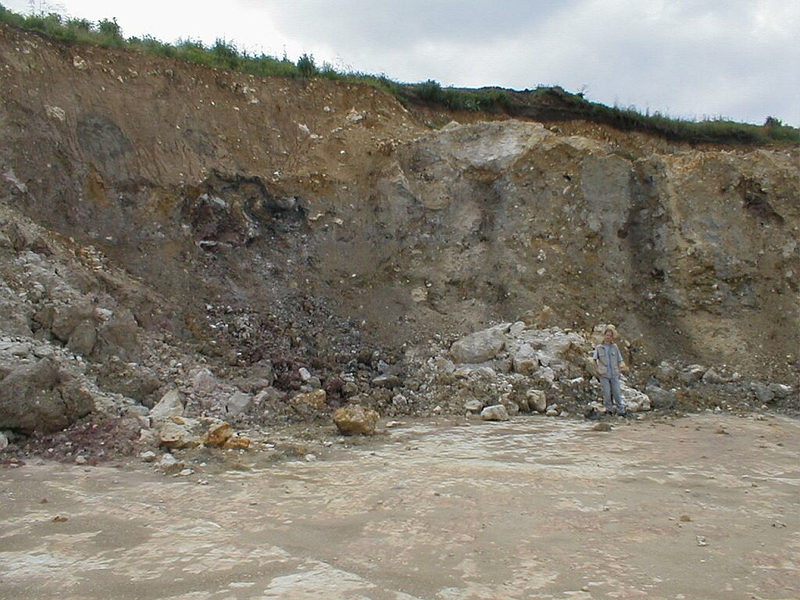 Exploitation of the Malmian limestone in the Oppertshofen quarry located in the overturned megablock ejected from the Ries impact crater.